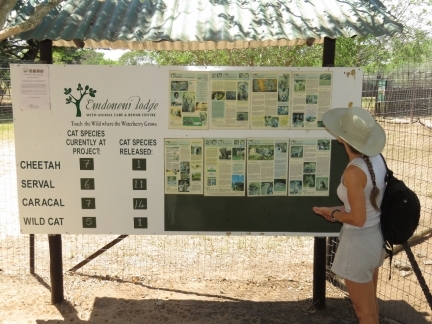 The Endomeni Rehabilitation Project cares for injured or abandoned South African cats with the hopes of re-introducing them into the wild. 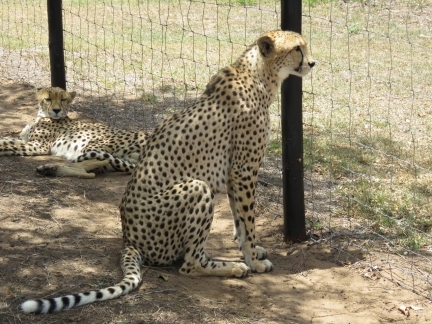 They offer tours of the facility that includes bringing visitors into the pens to interact with the animals. 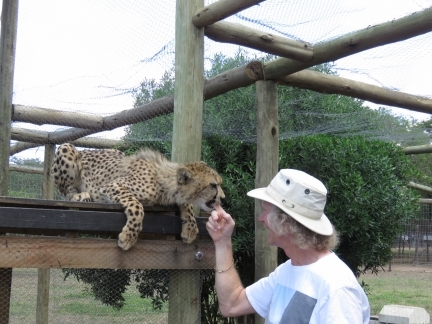 While we expected to touch a cat or two, we were amazed to find ourselves inside a pen with full-grown cheetahs and a cheetah cub. The Endomeni Rehabilitation Project is just over an hour’s drive from Richards Bay, so we visited as a day trip. 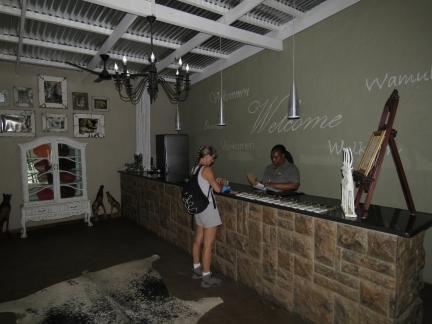 The project also has an on-site lodge for overnight guests, where we purchased our tickets. 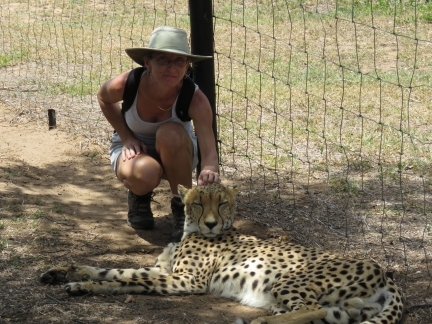 On site are currently seven cheetah, six serval, seven caracal and five wildcat. So far the program has released twenty-seven cats back into the wild. 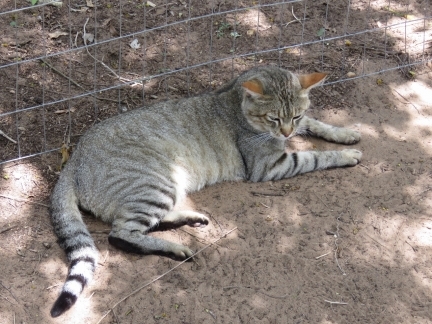 The first cats we visited were the African wildcat, the ancestor of the domestic housecat. They sure look like a normal house pet and have lovely soft fur. One distinction is that the African wildcat has all-black fur on the bottom of its paws. 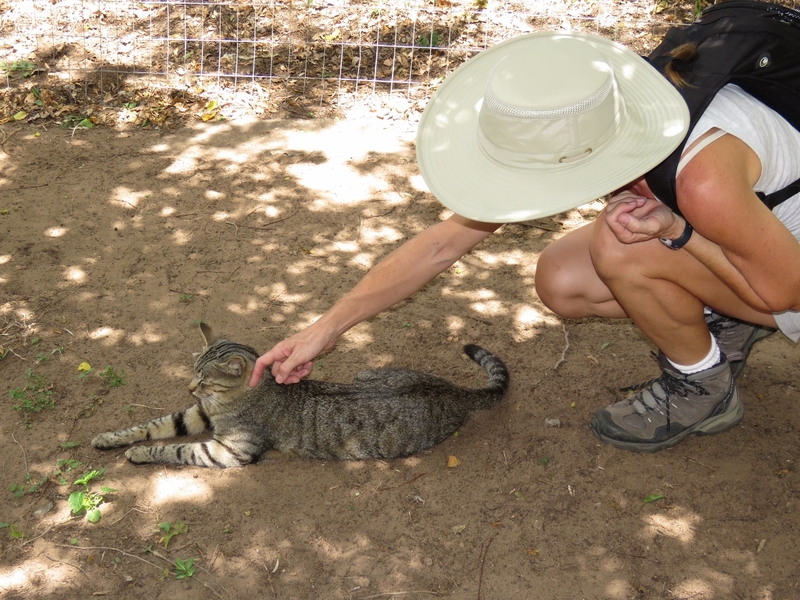 Some of the African wildcats were accustomed to people and could be petted, but others were still pretty wild. This one would tolerate our presence, but was too wild to pet. The next cats we visited were caracals. 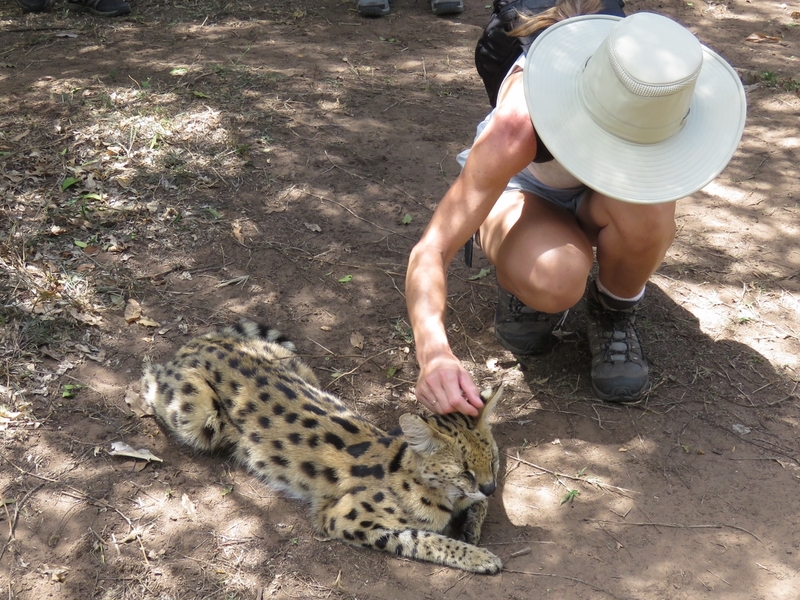 None were tame enough to be petted, but we could go inside the enclosure of one. 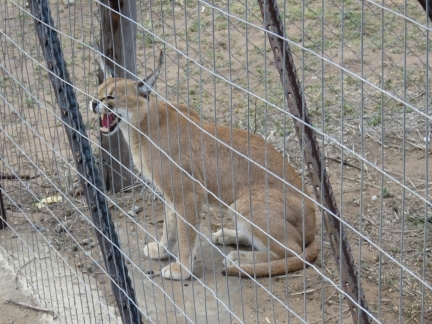 Some caracals were being kept away from people so that they would be afraid of them and could be more successfully re-introduced into the wild. 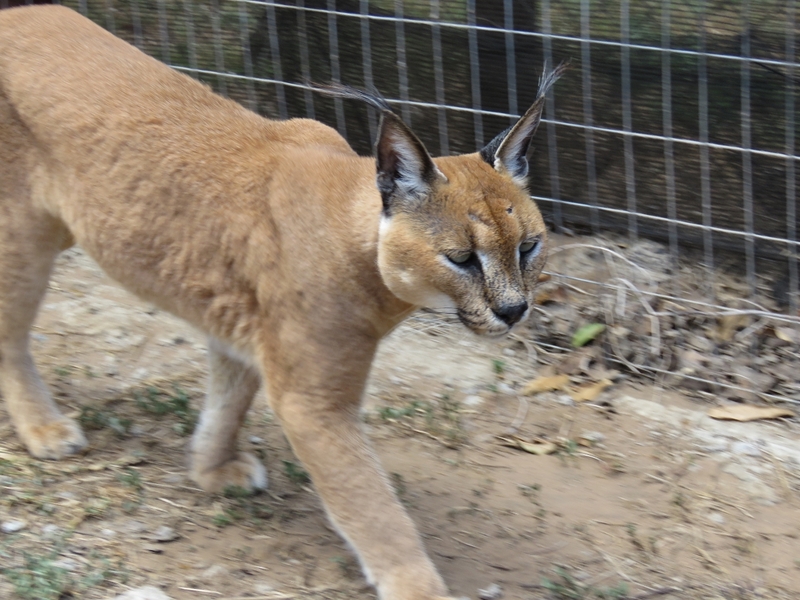 This caracal was still quite wild and we could only see it (and hear it) from outside the enclosure. The next cats were Cheetahs. We were pretty amazed to be actually inside a cage with a live cheetah. Sitting it stood almost as tall as Jennifer. 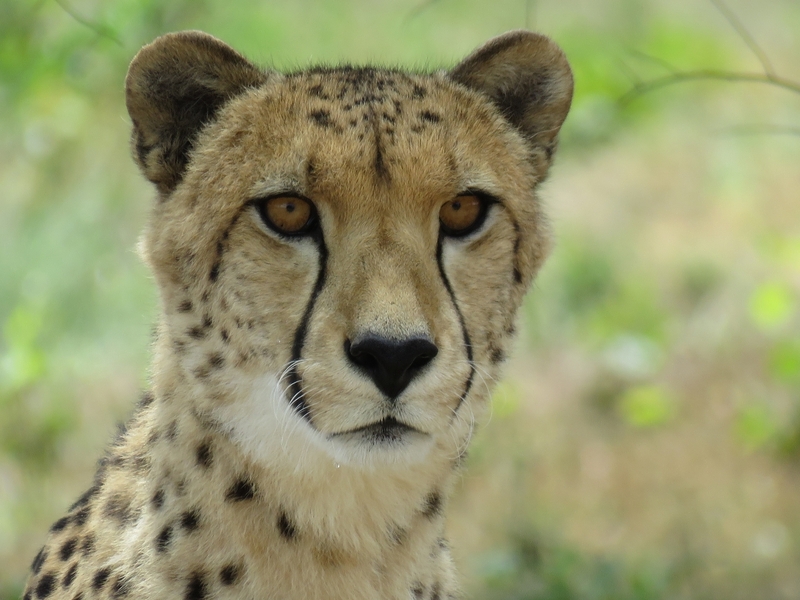 The beautiful markings of an adult cheetah. Not only were we able to be inside a pen with a cheetah, we were actually able to pet one. The guide kept a close eye on the interactions and gave us careful instructions on how and where to pet the animal. 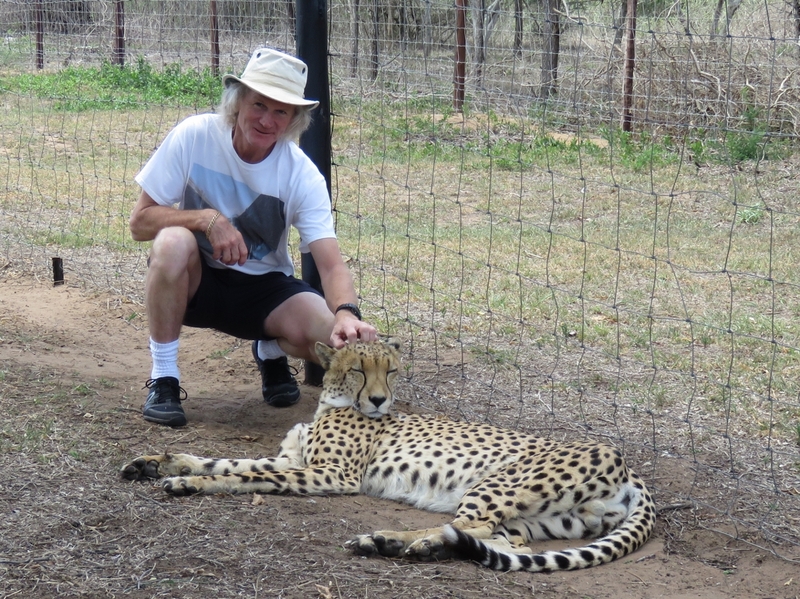 We still can’t believe we actually petted a cheetah. 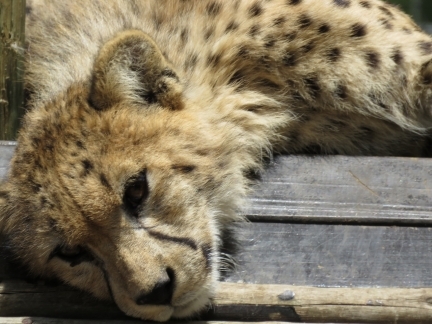 The star of the show was this cheetah cub–it was adorable. The cheetah cub was incredibly playful and would muss people’s hair all the while purring up a storm. Here he is chewing on James’ fingers. 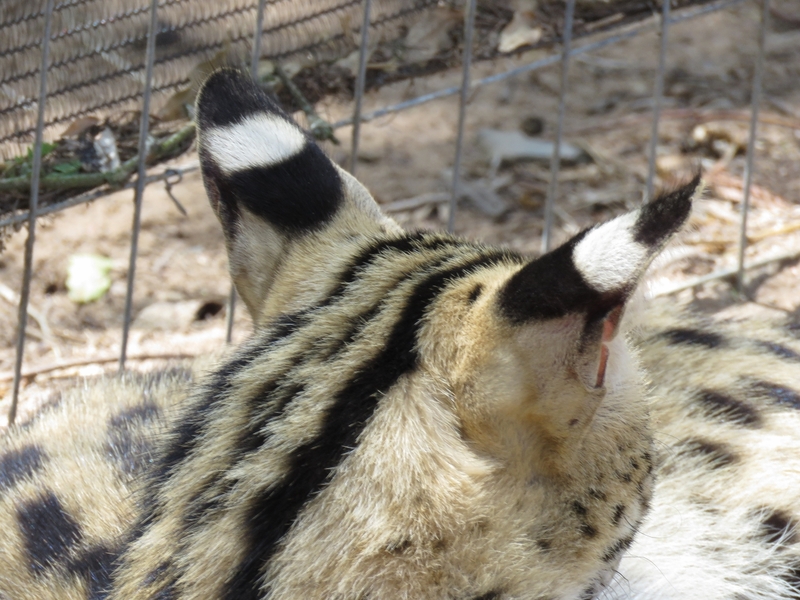 The fourth cat we visited were servals. They have beautiful markings that you can see on the video at https://youtu.be/bQ7Evj0J79g (0:22) The first half shows a caracal walking around it’s enclosure. It has a bit of a limp because it is older and slightly arthritic. The servil is small enough to be prey for the Verreuax’s Eagle, the sixth largest eagle in the world. The markings on the back of its ears are protective to make it appear to an eagle flying above that the cat is looking back at him. This cat is substantially bigger than Spitfire, so we’ll have to be very careful he doesn’t get carried off. 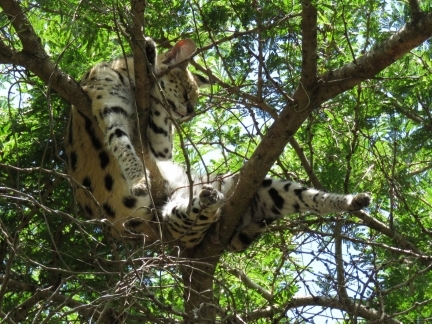 This servil apparently spends most of his time sleeping up in the tree branches. When we’d first arrived at the park and were waiting for the tour to start, two had jumped down from the trees to come see what we were doing. We stopped by Pro-Radio Marine at the Zululand Yacht Club to inquire about diesel and checked out their well-stocked store. Most of South Africa is malaria-free, including Richards Bay. 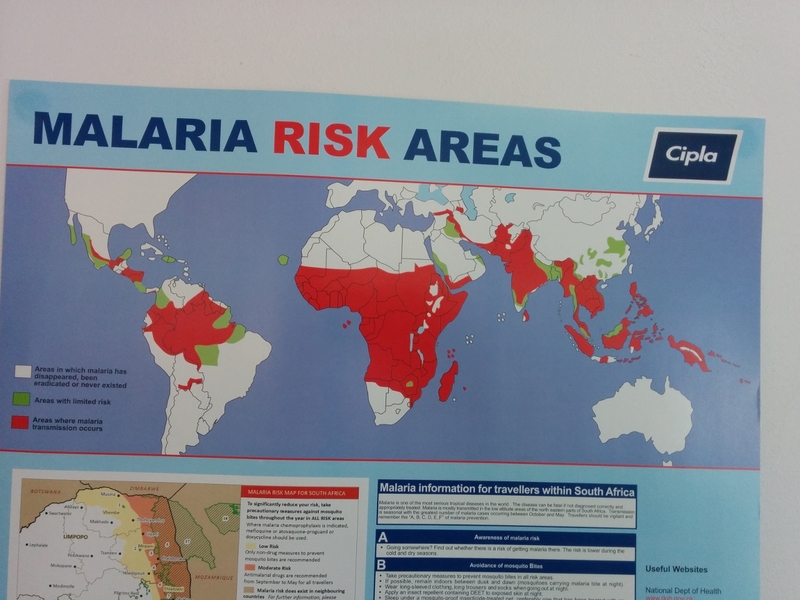 But some of the game parks we might visit a little further north have a risk of malaria. 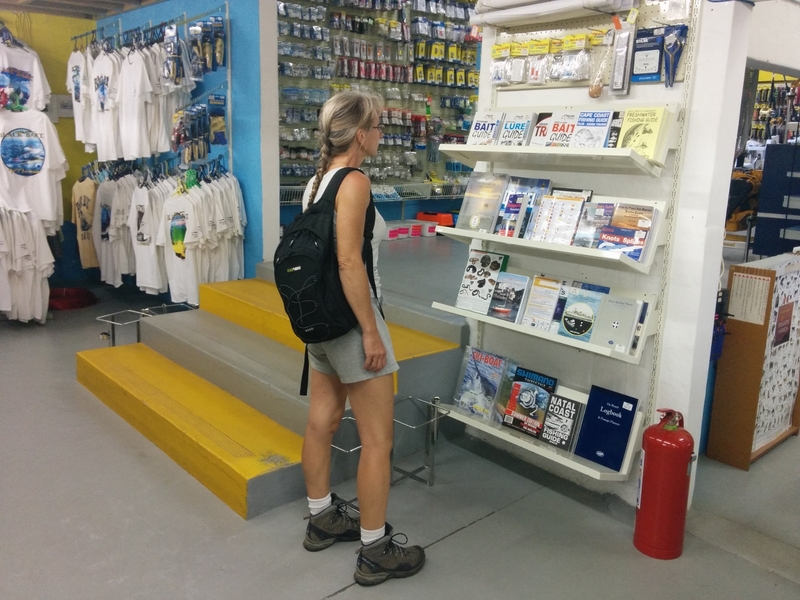 So we made a doctor appointment at the Meer En See Medicross clinic to get a Malanil prescription. 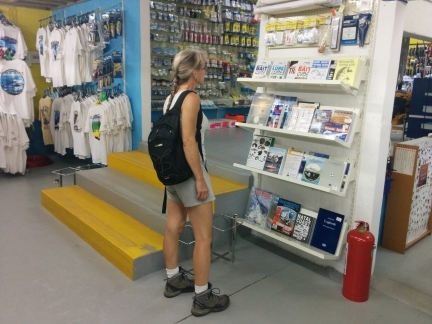 This is the same anti-malarial we took in Vanuatu (it’s called Atovaquone/Proguanil in the US) and has a nice feature of only needing to be started a day or two in advance of exposure where most other anti-malarials require starting a week in advance. 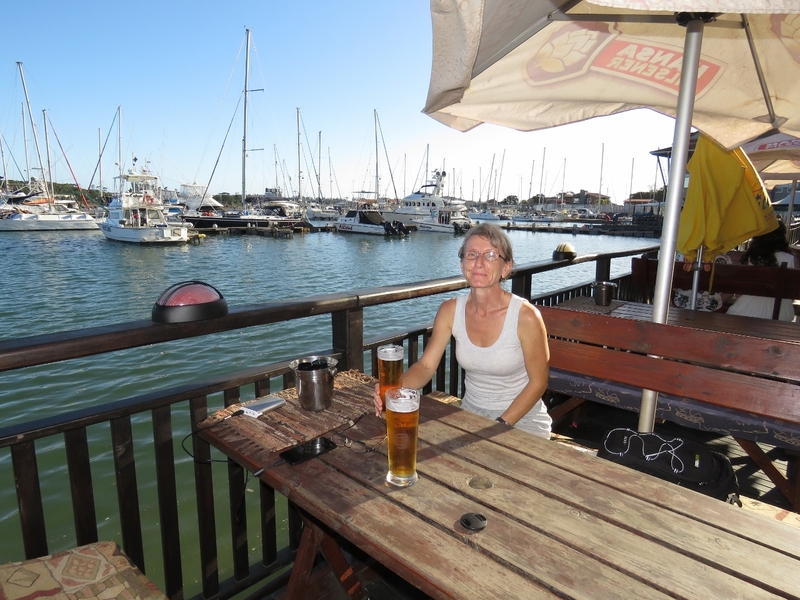 We finished the day with drinks at one of the Tuzi Gazi restaurants overlooking the marina.